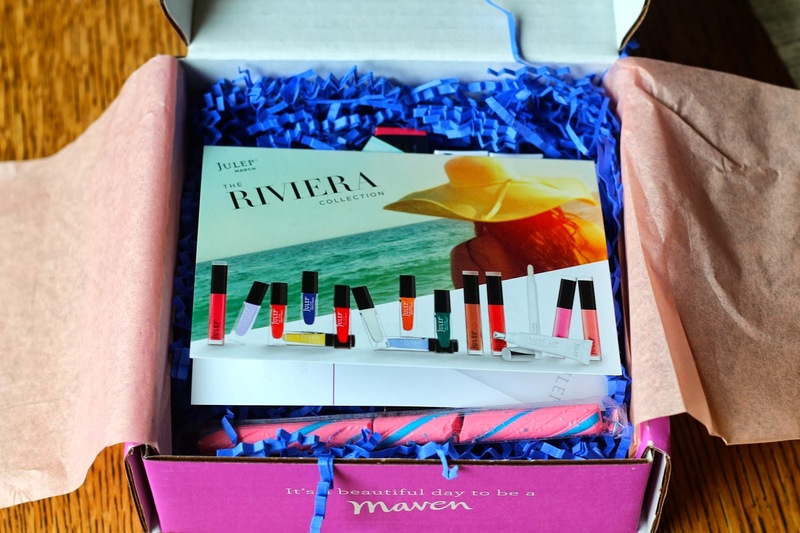 I, like many others this month, wasn't too excited about the Julep Maven colors this month. I chose the Boho Glam box, and a few add ons. They released the lip scrub and treatment spoilers, and I told myself I don't need more lip products, so my add ons were just a couple colors. I almost wish I could have had an option to swap the lipgloss for another nail polish, since I didn't want the It Girl box, and I'm getting lipgloss overload with all my subscriptions, and Ipsy Glam Bag replacement shipments. This month's included extra was a little Gilliam Stick Candy, I got Cotton Candy flavor. Harriet - ($14) Guava coral creme; Corals tend to look good on my pale skin, and I don't have many, so this was another I wanted. Elisa - ($14) Soft wisteria shimmer; I have a lot of purple shades, but nothing quite like this yet, so I've been wanting a nice pale purple color like this. Julep Lip Gloss in Enchanted - ($16) I don't know why Julep feels the need to introduce several lip gloss lines within a year, but this was the color that I liked the most/looked nothing like any of my current colors. I really love this though, has good staying power, pretty color, not too sticky, and it smells like a delicious cupcake! Lizanne - ($14) Sea green shimmer; One of the only other colors I was interested in getting because it looks like nothing else I have. Rae - ($14) Radiant orchid creme; I don't think I've ever heard more about a Pantone color of the year than this year's color, radiant orchid. Felt like I had to get it, just like I plan on collecting each month's birthstone polish each month. Tania - ($14) Multidimensional mermaid teal glitter; I loved the swatches for this, and I can't wait to do some nail art. Light colored nails with glitter tips is one of my new favorite manis to do. This will be perfect for it. Here's the swatch for the Julep Lip Gloss in Enchanted. It's very subtle, and I love the color. Looks great on my pale skin. I used a few Jules for this purchase so it only ended up costing me $30, and it was my third box in a row, so I got the free color code, which I plan on using on Soraphine, or the birthstone polish when it shows up. I actually ended up liking this collection much better once I saw other people's boxes, so I'm going to get the rest of the colors. I got the same colors as you! They are way prettier in person than they seemed at first glance. I know, I love them way more in person. I've decided I'm going to get the rest of the collection!